We organize a wonderful Sunrise Yoga Tour to the famous destination of Sarangkot which is the highest peak of Pokhara Valley and it offers amazing panoramic views over Himalayan mountain ranges. 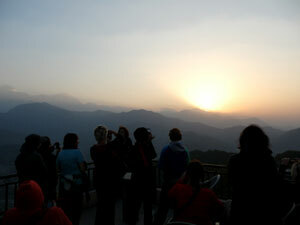 Without a visit to Sarangkot sightseeing in Pokhara remains incomplete. 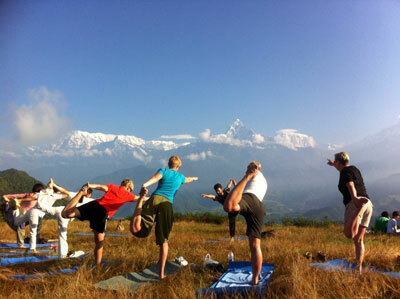 Sunrise Yoga Tour program has been designed to uplift physically, mentally and spiritually as it combines a short hike to see a spectacular sunrise against the panoramic mountain views of the Annapurna & Dhaulagiri ranges with a morning meditation and yoga session in breath-taking scenery. This program can also be combined with paragliding. This Program takes place on request and we need minimum 4 people. What is included: Transport, Breakfast, Yoga Class under the guidance of our yoga teacher.